Martha and I have been friends for a long time. We have many things in common: our devotion to our children and families, love of reading and learning, delight in travel and adventure. In other ways we are very different. Martha is a scientist and a very logical, rational and analytical person. I am a dreamer. Literature and stories are my avenues into the wider world. Even though we spar on occasion over our different ways of processing information, we have great love and understanding for one other. I love to tell stories, especially stories about my family. My friends are kind enough to listen, and when my sister and I get going, we might spend hours reminiscing about long-concealed memories. One of our favorite recollections is about our grandmother, Branka (my sister is named after her) known in our family as – The Great Beauty. Our grandmother had a magical life story. She came from a wealthy and powerful family of five sisters and one brother. The brother died from the Spanish flu in 1914, and the family fortune disintegrated in grief. As the most beautiful of the sisters, Branka married well and had two children. Her husband (whom she always praised as an excellent man) died young of tuberculosis. His family took away her son, and all the inheritance went to the boy, but Branka had no control over it. She was left a young widow, with a little daughter, and not much else. Then she met my grandfather, Nikola, who loved her and worshiped her like a queen. They had three children together and a very happy life. 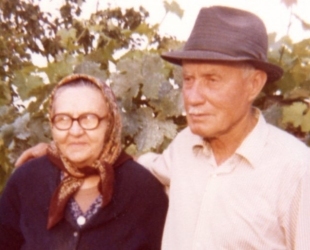 Deep into their old age, our grandfather still said that Branka was the most beautiful woman he had ever seen. “Do you have a picture of The Great Beauty?” Martha once asked. “Of course, I do,” I said proudly and ran to fetch the frame. Martha looked in disbelief and then started to laugh. I was confused at first, but when I looked at the picture through Martha’s eyes, I started to laugh with her. On the picture was a tiny, wrinkled, bent, old woman, in black clothes and a dark kerchief, wearing extremely thick eye glasses. “I guess you remember her differently,” said Martha, but the fact was that my grandmother looked like that as far back as I could remember. To me, though, as to my grandfather, she was still the most beautiful woman I had ever seen. Beauty truely is in the eyes of the beholder, it’s also measured with the love you have for somone as well.